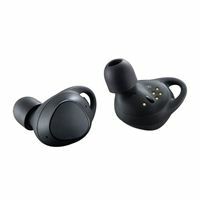 Listen on the go with the 2018 Samsung Gear IconX Bluetooth Wireless Earbuds in black. These earbuds are completely cable-free, connecting to your smartphone and each other via Bluetooth 4.2 so there's no cord to go around your neck. 4GB of onboard storage lets you listen without your smartphone. A built-in activity tracker lets you record your stats on Samsung Health while voice coaching keeps you motivated.